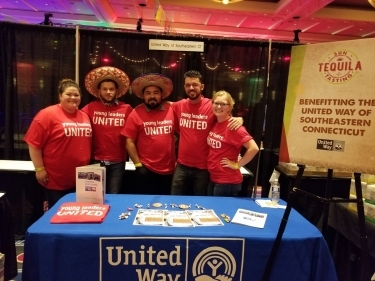 Young Leaders United, an affinity group with United Way of Southeastern Connecticut, is hosting its first benefit event for United Way and its Gemma E. Moran United Way/Labor Food Center. This exciting and fun “golfing for good” nighttime golf game takes place on Friday, August 31 at the Mohegan Sun Golf Club in Baltic. Registration is at 6 p.m. with golf beginning at dusk. Golfers compete in teams of four, using one ball per team and taking alternate shots at a total of four holes. After completing the holes, teams move to the short game area for a chance at hitting into the "ring of fire" with each team member receiving two shots. A total number of points will be tallied from each team's eight shots at the ring of fire plus their score from the four holes. In addition to the golf game, there will be a live DJ, other outdoor games, a food truck, and cash bar. The cost is $20 per golfer or $75 per team of four. Everyone is also encouraged to bring nonperishable food donations for the Food Center to help reduce hunger and food insecurity in our community. Each member of the winning team will be provided with an overnight stay at a Mohegan Sun hotel, courtesy of Mohegan Sun. The members of Young Leaders United are individuals ages 21-40 who want to get more deeply involved in Southeastern Connecticut. Young Leaders United participants have opportunities to Give, Serve, and Inspire their local community. The group is strongly committed to working together to help alleviate hunger and inspire youth in the community to reach for a healthier future. The Young Leaders United are a passionate group committed to mobilizing young professionals to engage in giving, serving, and inspiring meaningful projects that make a real difference. Engaging individuals and groups in volunteering. While contributing at a certain level to United Way is encouraged to be a member of Young Leaders United, it is not mandatory. All young leaders have much to offer in terms of advocacy and volunteerism. Interested in becoming a member of Young Leaders United or about Glow Golf? Visit www.uwsect.org/youngleaders.